The history of Poles in Batavia is a unique one in Western New York. While in other communities, Polish settlers moved in during the 1870s to 1940s slowly building up a Polonia that would influence the English language community, Batavia had just a single Polish settler who arrived in the 1840s and quickly became a community leader and politician. By the time Poles began arriving in Genesee County en mass at the end of the nineteenth century, this proto-Polonia pioneer was already forgotten. Major Henry I. Glowacki was born in Poland in 1816 to a military family. Because of his father, Henry had some tactical experience and participated in the November Uprising of 1830. After he was captured and exiled, Glowacki contacted his father’s friend in Ghent and was soon on a ship to the United States. Making his way to Illinois, Henry stopped in Batavia and after a conversation with the Holland Land Company, secured a job. Glowacki’s natural intelligence shined through. By 1840 he had passed the New York State Bar and became a lawyer. In time he would become a village trustee, president of the Board of Education, and a trustee of the New York State Institution for the Blind. In government, his most memorable accomplishment was the installation of stone sidewalks in Batavia. Henry married, adopted a daughter and made his home at 16 Summit. In 1895 Henry Glowacki passed away, just as another wave of Poles was making its way to the city. The second wave of Poles began peppering Genesee County in 1879. These settlers attended St. Joseph’s Roman Catholic Church for their regular religious needs and travel to St. Stanislaus Bishop and Martyr in Buffalo for special services. 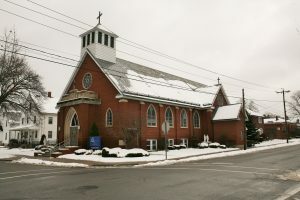 By 1904, it was believed that there was enough of a Polish presence to support a parish and Bishop Colton sent Father Peter Pitass to take a proper census. Once in Batavia, Father Pitass found 32 families and on October 1, 1904 formally established Sacred Heart of Jesus Roman Catholic Church. 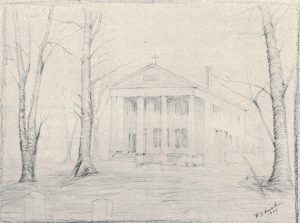 The first church building was a remodeled home located on Jackson Street near Kibbee Street. The old barn on the property was refitted and became the parish school. 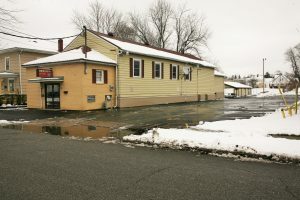 This location suffered from flooding caused by Tonawanda Creek and eventually the parish moved to 15 Sumner Street when a new church was built there in 1954. But while still on Jackson Street, Sacred Heart parish held one of the earliest Dyngus Day celebrations documented in Western New York in the spring of 1914. With the growing need for employment and now their own parish, Poles flocked to Batavia. In 1913, the Polish Falcons of American established Nest 493 and shortly thereafter the Polish National Alliance opened a Dom Polski on South Swan Street. Eventually the Polish Home suffered from a fire and was rebuilt at 123 Swan Street. Today Batavia’s Polonia is still very active. Sacred Heart survives as Ascension parish and 123 Swan Street was taken over by the Polish Falcons, who use it as their nest. And over a century after celebrating one of the first Dyngus Days, the post-Lenten party can still be found in the seat of Genesee County. "A Special Meeting Of..." The Times [Batavia, NY] 28 Apr. 1928: 4. Print. Barnes, Larry D, Henry Glowacki. A Polish Revolutionary in Batavia, His Wife and Descendants, and a House Divided: The Story of Henry Glowacki and His Family. Batavia, N.Y.: Larry D. Barnes, 2008. Print. Drabik, Michael. "Osada Polska W Batawi, New York." Searchers (Summer/Winter 1994): 1. Print. Ederer, Martin F. "Catholic Polonia in Western New York - 10 Genesee and Wyoming County's Polish Parishes." Am-Pol Ealge [Cheektowaga, NY] 10 Feb. 2005: 11. Print. McCulley, Mary. History of Genesee County, New York, 1890-1982. Interlaken, NY: Heart of the Lakes Pub., 1985. Print. "PGSNYS" Polish Parishes of WNY - Detail. Sacred Heart, n.d. Web. 19 Nov. 2016. Pienkos, Donald E. One Hundred Years Young: A History of the Polish Falcons of America, 1887-1987. Boulder: East European Monographs, 1987. Print. "Poles To Enjoy Swiecone Today." The Batavia Times [Batavia, NY] 13 Apr. 1914: 1. Print. "Sacred Heart Parishioners Observed 25th Anniversary" The Times [Batavia, NY] 19 Oct. 1929: 1. Print. "The Polish National Alliance Is Asking..." The Times [Batavia, NY] 24 Mar. 1928: 4. Print.